Colton Point was named in the late 1800s for Henry Colton, a lumberman who supervised harvesting of trees in the area. Logs were floated down Pine Creek to sawmills in Williamsport. The park was established from state forest lands purchased in the early 1900s. Colton Point State Park was developed by the Civilian Conservation Corps (CCC) from 1933 to 1936 and opened to the public in 1936. The CCC’s contributions are still visible today through the five stone and timber pavilions in the park. Three of the five pavilions have fireplaces. In 1988, the CCC built facilities that were added to the National Register of Historic Places. The park features rustic charm of the Civilian Conservation Corps (CCC) era of the 1930s. The Park also highlights 4 miles of hiking trails. This very narrow trail steeply descends to the floor of the Canyon and does not allow access across Pine Creek to the other side of the Gorge. Additional miles of trails are accessible through the Tioga State Forest, adjacent to the park. The “Grand Canyon of Pennsylvania” begins just south of Ansonia, along US 6 and continues south for about 47 miles. 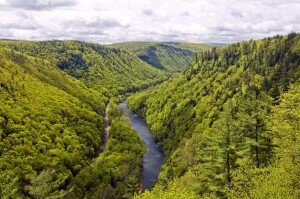 At its deepest point, Pine Creek Gorge is 1450 feet deep and nearly one mile wide. At Leonard Harrison and Colton Point state parks, the depth of the canyon is about 800 feet and these parks have the most spectacular scenic overlooks.